Because there are cows, well, everywhere. Home » Texas » Because there are cows, well, EVERYWHERE. Even on boats at the park. ← Industry in the middle of the country. Because there are cows, well, EVERYWHERE. Even on boats at the park. Yeah, this happens here. Welcome to Cow Country. Remember when I told you all how the bovine population outnumbered the human population in this town by ten to one? 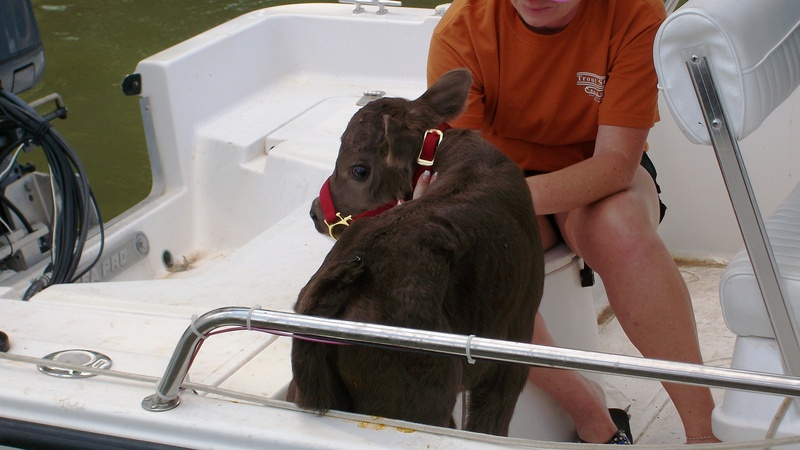 Even knowing that I was still amazed (and rather delighted) to see this little brown calf arrive at the park on a boat. 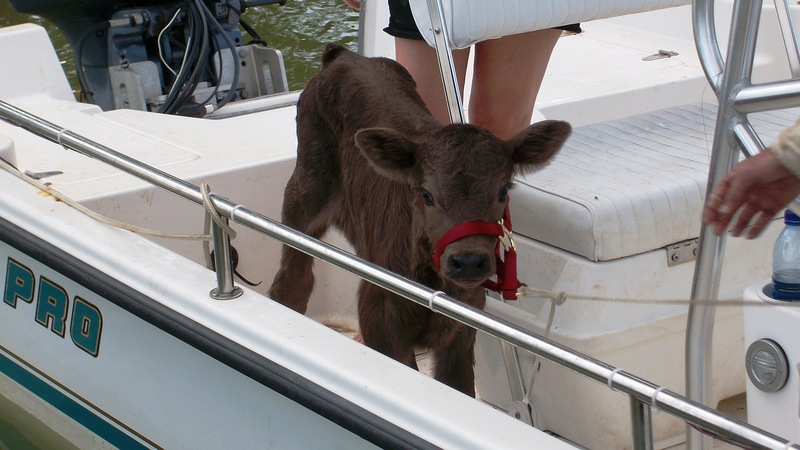 A calf on a boat, arriving at the park. I can’t make this stuff up. They named him Lucky, and believe he’s less than ten days old. That face makes me want to give up eating beef. He was rescued by the boaters when they saw him stranded in the lake. It appeared he’d fallen down a steep embankment and become separated from his herd. They looked, but saw no cattle anywhere in the vicinity at the time. More than 24 hours after reporting the found calf, and having received no response from the local Sheriff (can you say “Barney Fife”? ), they decided to give the calf to some rancher friends. Just another day in a Texas park. He looks so cute, I’d want to keep him until the cows come home. So cute…reminds me of a cow I had in High School in Philly…true story. Cow’s didn’t out number humans in my town tough. Very cool.